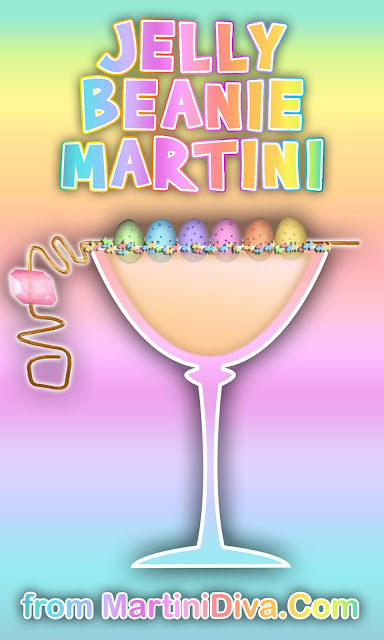 Dip the rim of your martini glass into the coconut cream and then into the Easter cake sprinkles. Chill glass in the freezer. * Mix 1 teaspoon of Honey Ridge Honey Creme Coconut with 1 teaspoon of hot water for the coconut honey syrup. 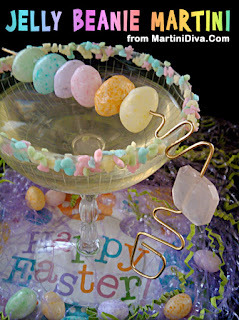 Put 1 of each color of jelly bean onto a cocktail pick and set aside. Add the ingredients to an ice filled cocktail shaker and shake until well chilled. Strain into the chilled glass and set the jelly bean loaded cocktail pick across the glass rim to serve.